If you didn't already know, this month's Glamour magazine comes with a voucher for 25% off at H&M. I'd spotted these boots in the H&M in Oxford Street but I thought they were a little too expensive for me that day, as I'd already spent too much money. When I bought Glamour magazine and saw the voucher, I knew I had to get these shoes. There is a comfy rubber heel on these boots, which won't wear away like other heels I own (and need to get repaired). The cut-out detail is particularly popular for the Spring season so I'll be stocking up on black socks to wear underneath. The silver buckle also gives the boots an extra bit of detail. In a nutshell, I'm in love with these. I like them so much that I actually don't want to wear them. Do you ever love an item of clothing so much that you don't want to wear it because you might ruin it? Just me? 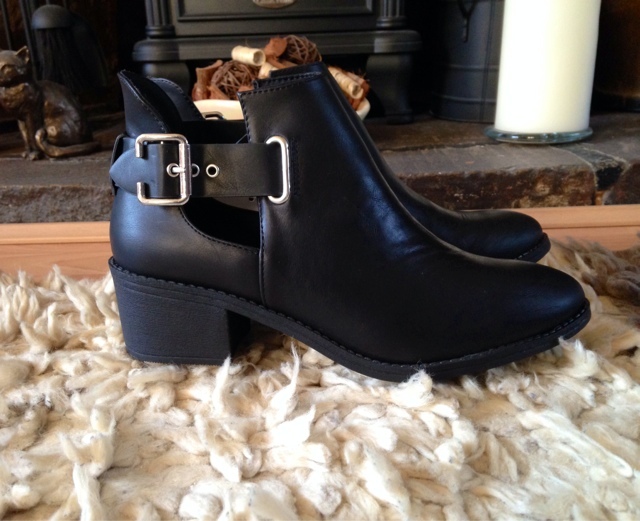 This is the perfect pair of boots, I love my pair I wear them all the time! I always pair mine is a pair of frilly socks too. The shoe looks so pretty! I love it, I saw them at H&M as well and I was thinking if I should get it or not.